This Is Arguably The Most Important Scratch Music Release ever. I can not stress enough how complex, & just plain hard this Record is. It has changed my life as an artist forever. He has set new boundaries for the Scratch World & Broke Them all at the same time. Please, Do Not Say I Didn't Warn You. This Will Affect you, One Way or The Other. 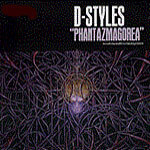 All Music Performed/Scratched by D-Styles. Besides 1 song Feat. Q-Bert, Mello-D, & Babu.